When it comes to roosters, Brewster will soon be a place the noisy birds won’t be welcome. 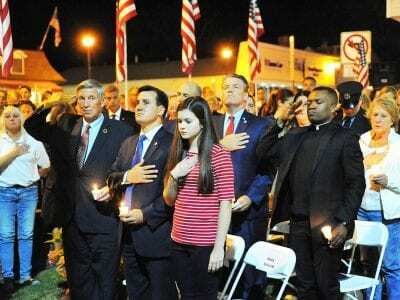 Members of the Village Board conducted a public hearing last Wednesday evening where Mayor James Schoenig, Deputy Mayor and Trustee Christine Piccini and Tr… Please login below or purchase a subscription to the Putnam County Courier to access this content. Dozens of residents in the Glenvue Drive, Glenvue Drive North, Gleneida Ridge and Ridge Court sections of Carmel have had it with brown and yellow colored water pouring from their faucets and in many instances clogging individual water filtration sys… Please login below or purchase a subscription to the Putnam County Courier to access this content. The new school year is just one week old yet seven students enrolled at Carmel High School have been selected to perform with other outstanding student musicians from around the U.S. as well as New York State. 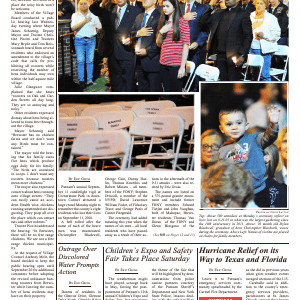 Superintendent Andy Irvin reported the o… Please login below or purchase a subscription to the Putnam County Courier to access this content. New School Year Kicks Off! 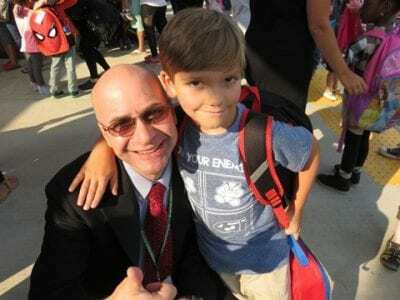 JFK Elementary School Principal Frank Zamperlin gets a ‘welcome back’ hug from six year old Mike Callaro. Photos by Eric GrossSmiling faces, new sneakers, backpacks and haircuts were the order of the day Tuesday when the 2017-18 school year officiall… Please login below or purchase a subscription to the Putnam County Courier to access this content. Sept-Oct Reading Puppies on Thursdays at Patterson Lib. More info: 845-878-6121 x10, pattersonlibrary.org Sept-Nov Various Story Times at Patterson Lib. More info: 845-878-6121 x10, pattersonlibrary.org Sep 7-Oct 12 (Thursdays)- 10am-12pm Begin… Please login below or purchase a subscription to the Putnam County Courier to access this content. Dear Editor, After last night’s Hamlet of Carmel Civic Association Candidate Forum, it is even more evident that we need to vote for Michael Barile for Carmel Councilman in Tuesday’s Republican primary. Mr. Barile has not only has the best grasp of… Please login below or purchase a subscription to the Putnam County Courier to access this content. Dear Editor, We are writing this letter to show our enthusiastic support for Melinda Montanaro. In addition to being a tireless and dedicated Southeast Town Council candidate, Melinda is a woman we are grateful and honored to call our friend. We hav… Please login below or purchase a subscription to the Putnam County Courier to access this content.